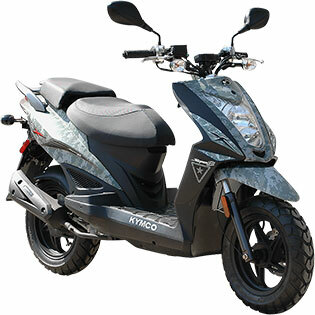 The peppy SOHC 49cc 4-Stroke engine coupled with KYMCO’s flawless CVT automatic transmission add up to unbelievable performance, fuel economy and the best value in a 50cc scooter available today! Check-out the 2-up buddy seat that doubles as a rider backrest. Available in Matte Black or Digital Camo. Claimed Dry Weight 210.5 lbs.